When last we left the SuperFogeys, Captain Spectacular’s son, Tom, was introducing his father to his new girlfriend–Dr. Rocket’s adopted daughter Ms. Missile. Just then, The Third Man appeared in all his menace and made the claim that one of the assembled–Captain Spectacular, Swifty, Tom, Ms. Missile, Dr. Rocket–is about to die. 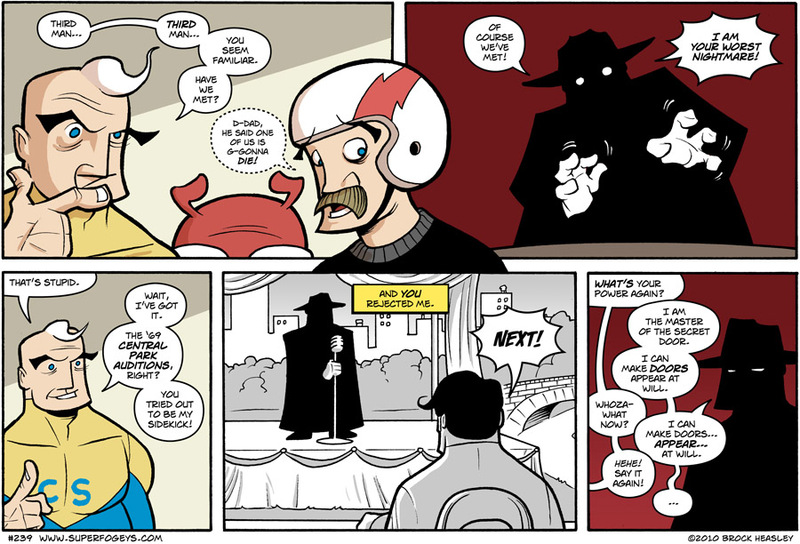 Anyone who owns a copy of The SuperFogeys Volume One knows exactly what story today’s strip is referencing in flashback. You can find a preview of that story here, but if you wanna read the whole thing I’d highly recommend clicking on that Volume One link. 1. SITE OVERHAUL - That’s right, this site will be getting another overhaul. Whole new look and some whole new features. Should take effect in the next couple of months. Chief among the new features will be a new way of blogging that will be separate from the comments attached to the strips. As such, the strip comments will be more about the strip itself, and any news or other nonsense I have to say will go in the blog. The blog will be featured here, on the main page, so you’ll never miss anything. My goal is to give you something every day worth checking out–whether it be fan art, sketches, previews, thoughts, whatever, etc. 2. MORE INVOLVEMENT IN TALL TALE FEATURES - As most of you know, I’m a member of a great collective of cartoonists known as Tall Tale Features. The biggest thing to come out of Tall Tale as been Tall Tale Radio, hosted by Tom Racine. The rest of the site has been basically dormant for the better part of a year. That’s gonna change this year and part of that change involves me more regularly contributing to Tall Tale Features. You’ll see a blog here and there from me, but the thing I’m most excited by is that we’re going to start collectively reviewing webcomics that are submitted to us, and also critiquing our own members’ comics. More details on that as it happens, and of course I’ll always let you know when there’s new content on that site from me that’s worth checking out. Last year at this time I changed my SuperFogeys schedule by introducing SuperFogeys Origins (which I write but other artists draw) and down-sizing the regular SuperFogeys strip (which I both write and draw and color and…you get the idea) to a once-a-week thing. I did this in order to work on a passion project of mine, a memoir about my father and growing up called, at the the time, Bullets and M&M’s (I’ve since changed the name toRaised by a Dead Man). I did this with the intent of having the book finished in one year’s time and then returning the regular SF strip to twice-a-week and, hopefully, continuing SFO at the same time. Well, the fates conspire. Not only did SF take up more of my time this past year than I thought it would (putting Volume One together was quite the undertaking), but, having never written a book before, I had no way to accurately anticipate just how much work and how much time would be involved in that. Quite a bit, as it turned out. I’m happy to report that I’m 65,000 words into Raised by a Dead Man, but I still have a ways to go and then the work of getting it published begins, which is an entire task unto itself. So when will SF get back to its regular, intended schedule? I don’t know. I hope this year, but you never know. I confess my priority is Dead Man. I think it’s the finest thing I’ve ever created and I feel like it’s the most important thing I’m working on at the moment. I have to follow that to the end. Which is why it will probably be surprising to you to hear that I’m also about to debut an entirely new comic creation. Something not in any way related toSuperFogeys. This is something that’s been in the works for about 2 years, and that I’ve always referred to as my “secret comics project.” Well, very soon now, the veil on that project will be lifted. This is something I’m doing with a team, so it doesn’t take up quite as much of my time as either SF or SFO do. This project could end up being a bigger deal than either of those, but rest assured that I remain firmly committed to SF and all of you here. You’re gonna find a whole lot more about that soon. Stay tuned. 4. LESS COMMENTING FROM ME IN THE COMMENTS SECTION - New demands on my time mean that something has got to give. Up til now, I’ve made it a point to respond to each and every one of you in the comments section below the strips. This is something that I’ve enjoyed IMMENSELY. Sadly, I’ve decided to stop this practice in order to free up the time I need to bring you more content. I’ll still be active in the comments section, but now I’ll only be responding when I feel like I’ve really got something to say, or to answer questions specifically directed at me. My hope is that this won’t dampen your enthusiasm for commenting on the strips. At this stage in the game, the monetary rewards are few and your comments are really the fuel to my fire. Who knows? Maybe it’ll be even more fun commenting and speculating without me coming in and adding my slightly-more-informed-on-all-things-SF comments. 5. DISCONTINUATION OF THE “SINGLES” - Up through Chapter 5 of the SuperFogeys, each chapter was published in its own “single” comic book. Late last year, those chapters were all collected into a mega book entitled “Volume One” and the publication of those “singles” was discontinued. I, along with Th3rd World, have made the decision to no longer publish chapters in the “single” format, preferring instead to collect the chapters into one large book when there’s enough to do so. This was a hard decision to make, but my sense is that most of you prefer the larger collections. This does mean a long wait before you’ll see a chapter in print, but I think the wait will be worth it. 5. SUPERFOGEYS ORIGINS VOLUME ONE - Of course, you won’t have to wait long for the first SuperFogeys Origins Volume because that’s happening this year! This is gonna be a big one with an all-star cast of artists. Watch for it. I think that’s enough change for one day, don’t you? The Six Wives of Captain Spectacular continues on Tuesday as we meet both wife number 2 and wife number 3. One of those will be a familiar face. Can you guess which? Then, on Thursday, The Third Man makes his move. Trust me, you don’t want to miss this one.